We like the heart. We like the space. 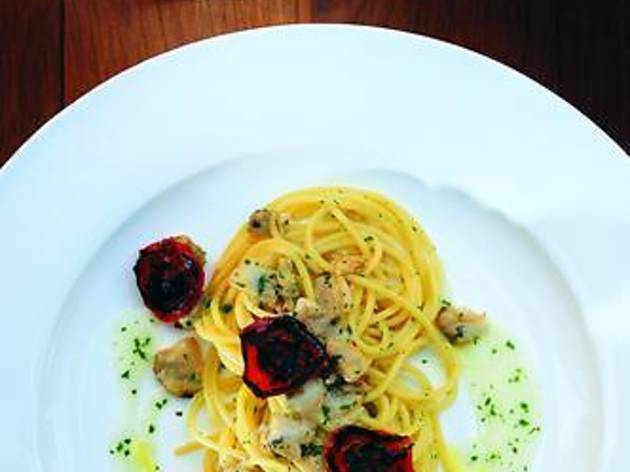 We like almost everything there is to like about Domani – except for its prices and portions. But isn’t that usually the case when it comes to fine dining? You’re never just paying for the meal, but for the experience that surrounds it. So what exactly does your money buy you at Domani? A purpose-built spacecraft-like structure on a newly reclaimed part of Pacific Place, with a private outdoor patio and views of the harbour beyond… atmosphere, check. A 1:4 serving staff-to-customer ratio means everybody knows your name and remembers your drink… superb service, check. An ultra luxe menu from tasty chef Mauro Uliassi of Michelin-starred restaurant Uliassi in Senigallia – who, interestingly, just received another Michelin star on November 20, bringing his restaurant’s grand total to two – and his team of renowned chefs including Massimo Bomprezzi… superstar talents in the kitchen, check. So why didn’t we enjoy our dinner? For one, they have an online booking system which looks convenient; you enter your name, phone number and preferred date and time… and then realise that you have to wait for the restaurant to call you back to confirm or offer alternatives, meaning it’s probably easier to call them in the first place. So much for the world of domani (that means ‘tomorrow’ in Italian). For another thing, they have a $350 appetiser called the Black Hole, a prawn-potato fondant and black truffle concoction (it was originally priced at $390 on opening day a week earlier, perhaps an acknowledgement by the restaurant that it may be overcharging). Even at the reduced rate, we couldn’t justify ordering an appetiser so ridiculously priced. My companion told me not to even bother cracking open the wine list as most selections cost at least four digit sums. So instead we skipped straight to the mains, starting with the Domani smoked linguine with clams and roasted cherry tomatoes ($210), and a grain soup with San Daniele ham, pecorino cheese and black truffle ($120, again down from the opening day price of $150). The pasta was mislabelled: the noodle was neither smoked nor in any way a flat egg noodle, although the cherry tomatoes were certainly sweet and delicious. The portion was piccolo-sized, which for us was five swirls on the pasta fork. “These are Michelin portions,” I was reminded by my foodie companion. The dish, though wonderfully tasty, was not particularly special, and left me wondering whether $210 would’ve bought me a whole lot more elsewhere. The thick harvest grain soup came with a side of toasted bread cubes. Again, rather good, but not worth the $120 price tag. We’d requested a counter seat at the edge of the massive open kitchen where 20 chefs manage their station. If Domani seats 120, that’s roughly one chef to every six diners in a full house, and that is not including the kitchen staff working behind the scenes in the back. So why then did we wait an hour for our first course, and another 20-something minutes for our mains? This may have something to do with the chefs in charge. Remember the renowned names listed above, from Michelin-starred restaurants? Well, Uliassi had already flown home to collect his new star (with next February pencilled in for his next trip out here), and the chefs brought in for the opening have also left, which brings us to the man who will really man the kitchen – the executive chef from Grappa’s a few floors down. Bait and switch? It seems so. However, you can argue L'Atelier de Joël Robuchon does it, as do Nobu and Pierre. But let me quote you a line from the restaurant’s press release: ‘Domani will definitely take Italian cuisine to a new level. Featuring the Michelin-starred chef Mauro Uliassi, as well as renowned chef Massimo Bomprezzi…’ The word ‘featuring’ is used liberally – for now only their ghosts remain in the machine. Back in the land of the living, our main courses were assembled right in front of us. We saw half a lobster pulled out from a hot bath; we saw the executive chef give his junior a hard time over a botched salad; we saw a bunch of stressed-out people looking and prodding, and pushing and steaming. Kitchens are not usually delightful places; they are pressure boilers best kept hidden. So if you are brave enough to have an open kitchen like this one, be sure your staff are prepared to be actors as well as chefs. The Canadian lobster ($310) came on a half shell. The meat was pulled and steamed perfectly, then mixed with halved cherry tomatoes and onions in a light vinaigrette. This four-bite wonder was perfect in every way but size. Don’t get us wrong, we appreciate good food; we just want to be left satisfied as well. The beef tenderloin ($380) was a full 200g loaded with roast potatoes, capers and olives. This was a great cut of meat, seared to a delicious brown, and though not one of Domani’s most inventive dishes, was lovely overall. The menu is not very big – around four or five items per course – but the food that comes off it is top rate. We just wish our courses had been properly timed and that the restaurant didn’t set its prices right on the threshold of what they think consumers are prepared to pay (and did we mention the size of the portions?). 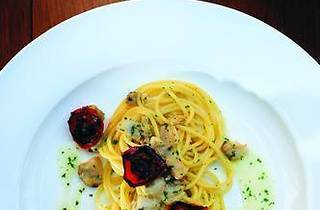 4/F, Pacific Place, 88 Queensway, Admiralty, 2111 1197; www.domani.com.hk. Daily noon-10.30pm.